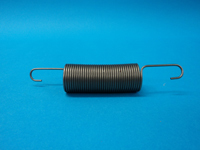 To solve the problem of breaking extension hooks, Maverick Spring Makers Limited redesigned the Music Wire Extension Spring. The initial design featured a hook radius that was equivalent to the body radius, which resulted in excessive bending stresses in the hook when it was at full deflection, and ultimately premature hook failure. To redesign the Extension Spring, Maverick Spring Makers created a smaller hook radius to reduce bending stress and to eliminate premature fatigue failure. The reduced hook radius still fit easily into the assembly. For more details about this project or to learn about our other services, please contact Maverick Spring Makers. Outside Diameter, body 0.862" +/- 0.005"
Outside Diameter, hooks 0.455", +/- 0.005"
Free Length, Inside Hooks 4.625", +/- 0.032"